A guinea pig makes a good child's pet because he's docile, clean and easy to handle. If your pet is losing hair and you see white bugs in his cage, he may have external parasites. If so, he'll scratch incessantly and may run in tight circles. A trip to the vet for a diagnosis and treatment schedule should cure your furry pet within a few weeks. Mite infestations are generally the most severe of external parasites on a guinea pig. Scarcoptic mites are white and spiderlike. They live in the outer skin layers. 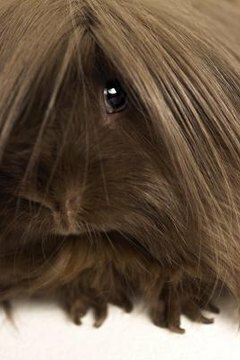 In guinea pigs they cause intense itching, running and hair loss in the infected areas from wounds. The wounds can crust over, especially near the ears. Lice are tiny, flat white insects that live in a guinea pig’s hair. Adult lice and their eggs attach themselves to hair shafts. Lice cause scratching also, but with minimal hair loss, or alopecia. If left untreated, external parasites can lead to self-mutilation, debilitation and infection from skin scratches. Severe cases can cause death. Your veterinarian can distinguish whether your guinea pig has mites or lice. Skin scrapings in the hair loss area are viewed under a microscope to determine if mites are present. The treatment is usually one to four injections, depending on the severity, of an antiparasitic drug. Lice infestations are diagnosed by examining hairs under a microscope from an infected guinea pig. Lice are normally treated with a special shampoo to kill and remove them from your pet’s body. Remove a guinea pig or pigs from a cage that is infected with external parasites. Scoop out all of the bedding material and dispose of it. Spray the cage thoroughly with a solution of 10 percent bleach and 90 percent water in a spray bottle. Do not put your cavy or cavies back into the infected cage for three weeks. This allows the infestation to die while your piggies get treatment from the vet. Continue cleaning your current guinea pig cage in the same manner weekly and supply him with soft bedding, such as paper towels, to help alleviate his scratching. It is a good idea to quarantine a new guinea pig in a separate cage for a few weeks before placing your new pet with others. This gives you time to observe your new pet for any signs of external parasites before infesting your current piggy.